ITC’s hotel group just re-launched the most sought after food and beverage loyalty program in town! ITC has stepped up its loyalty program game like no other, if an ever rewarding point based membership card wasn’t enough, ITC now brings to you a bouquet of 11 experience certificates designed to cater to your fine culinary palate and provide experiences that complement your distinguished taste and lifestyle. Especially curated to give you the best of both worlds, the Club ITC Culinaire membership with revised benefits now offers the opportunity to earn points on dining and staying spends at the hotel and redeem certificates to enjoy exclusive experiences. The set of 11 new indulgent certificates offer a range of experiences including a one night/two day stay with buffet breakfast, one-time upgrade to the next category of rooms, 20% savings on Welcombreak packages, 50% savings on the food and beverage bill up to a table of four guests, 25% savings on buffet lunch or dinner, 30% savings at the gourmet shop, a cake and a redemption of products at participating Wills Lifestyle stores. Be it a vacation, staycation, getaway or a celebration, the new Club ITC Culinaire is your answer. Enjoy your experience at the hotel a little more with each experience certificate. But wait! A combination of rewards and certificates is not all that the revised membership brings to you. It offers two exclusive member’s only offers, Gourmet Fridays and High-Spirited Wednesdays. Gourmet Fridays let you earn 50% bonus points on dining spends at select restaurants every Friday while High-Spirited Wednesdays offer 2 drinks at the cost of 1 at select bars between 6 pm and 8 pm every Wednesday. The plethora of benefits come in addition to Club ITC Culinaire’s existing set of card benefits offering 25% Green Point earnings on dining spends including alcohol at ITC and WelcomHotels, 20% earnings on dining spends including alcohol at Fortune and WelcomHeritage Hotels up to a table of 8 guests and 5% earnings on all eligible spends while staying at participating ITC Hotels, WelcomHotels, Fortune Hotels and on spends at Wills Lifestyle Stores. Visit www.hotelmemberships.com or call 1800 103 2482 to enrol into the programme to begin your point earning and certificate redemption journey. Mark your calendars and reserve your tables because India’s favourite hotel chain, ITC’s hotel group is bringing to you another spectacle of luxury with the launch of its newest hotel, ITC Kohenur on 1st June 2018. The hotel promises to create experiences as priceless as the city’s pearls. Touted to be Hitec City’s first business luxury hotel, the 271 roomed hotel’s interiors have been inspired by the Nizam’s famed jewels. ITC Kohenur will bring ITC’s culinary excellence to Hyderabad through its signature restaurant brands like Golconda Pavilion, Ottimo, Peacock Bar, Rooftop Bar, Dum Pukht and Yin Jing. Overlooking the open air swimming pool at ITC Kohenur, Golconda Pavilion will offer a fine spread of Indian and inventive international cuisine and an extensive beverage bar. Ottimo is the signature pan-Italian dining experience that celebrates quintessential Italian dishes prepared from the finest local and imported ingredients. Grand and majestic, Dum Pukht, will beckon you to partake in a royal feast as it presents age-old recipes and authentic flavours from the kitchens of the Nawabs of Awadh. Yi Jing will present a unique ‘sonnet’ of tastes & textures inspired by a combination of techniques from freehand Chinese painting to bonsai grooming, giving rise to the most exquisite contemporary culinary interpretation of Chinese Culture. What’s even better than all that we mentioned? 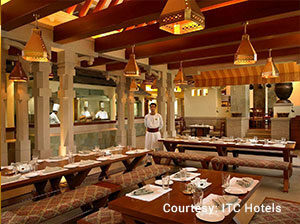 You can save at the brand new property with the Club ITC Culinaire card. Get an enrolment bonus of 6,000 Green Points redeemable for a complimentary room night stay, earn 25% Green Points on your dining spends, 50% bonus earnings on dining spends during birthday weeks and more.